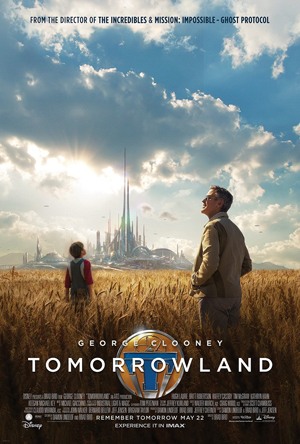 Review – Tomorrowland: A World Beyond | The Cherry POP! First of all, I must apologise for this very late review of this movie, it’s safe to say I’ve had an extremely busy month but lets right get down to it. Brad Bird, the very talented director responsible for timeless kids classics such as: The Incredibles, Ratatouille and The Iron Giant and he’s also known for breathing life into the tiresome Mission Impossible franchise with his first live action directorial effort in Ghost Protocol. Unfortunately, Bird’s talent couldn’t make Tomorrowland fly. The ambition that this movie has seeps through the screen from its impressive, slick visuals and it’s intriguing message of saving our planet but it simply does not manage to also provide entertainment. The plot centers on tech-genius Casey Newton (TV actress turned rising film star Britt Robertson) who is arrested after trying to sabotage the factory where her dad is soon to be unemployed from. 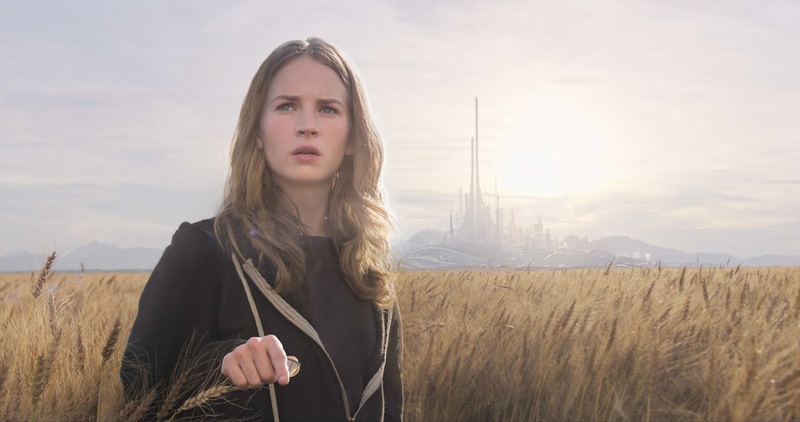 It’s at the police station where Casey discovers the crisp, clean world of Tomorrowland where everything is possible after touching a mysterious pin hidden in her belongings. She sets out to discover all she can about this brave new world once the power of the pin runs out, which gets her involved in many dangerous situations along the way. One of, if not the biggest problem with the film is pacing. It’s all over the place, starting with a sweet, gooey centered opening scene of a young boy attending the 1964 science fair to endless conversation and exposition. However, this sense of wonder and delight reaches its pinnacle after the first 10 minutes. Robertson is a surprisingly fresh lead who carries the film well, she’s not a simplistic heroin, nor is she the tomboy that wants to be one of the boys, she’s an everyday sort of girl who is understandably mistified by what she has experienced. 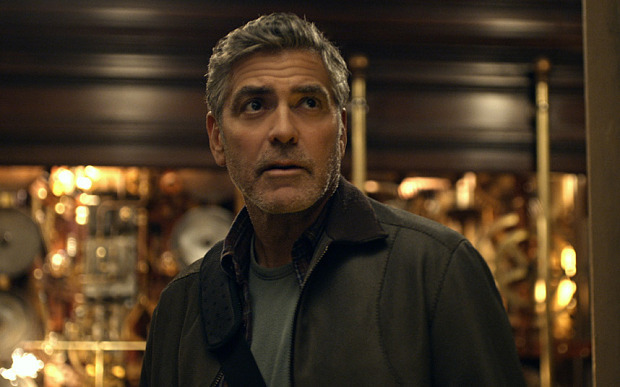 She shares good chemistry with George Clooney, who portrays a washed up genius who was kicked out of Tomorrowland for reasons I won’t spoil, but Clooney doesn’t just phone in his performance, he gives it his all, which is difficult to do from a character that’s one note until the final act. A big participant in the action scenes as well as the standout role is Raffey Cassidy who plays Athena, a young girl who acts as the main recruiter for the next generation of brainy kids. She’s a refreshing character who ties the film together through its characters and plot points. Hugh Laurie rounds out the cast, who is of course predictably charismatic and reliably enjoyable. Overall, Tomorrowland is all bark and no bite. Despite its larger than life plot and a cast of well assembled actors and actresses it fails to make a lasting impression. Perhaps its too smart for children but too preachy for adults and as I previously mentioned, with Brad Bird’s history of action and comedy, this project would have been great if it utilised more of both. This entry was posted in Film and tagged 2015, Action, adventure, Britt Robertson, Disney, film, George Clooney, Hugh Laurie, review, Tomorrowland. Bookmark the permalink.